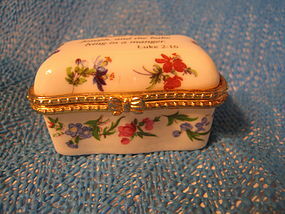 Hinged lid box inscribed with Luke 2:16 (They found Mary and Joseph and the babe lying in a manger). It measures 2 1/4 x 1 1/4 x 1 1/4 inches. There is little, if any sign of use. I need your zip code to calculate the postage. 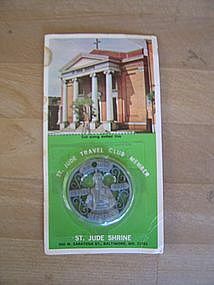 Vintage medallion for July 1976 to June 1977. There is aging to the cardboard, as well as staining and a few creases. I need your zip code to calculate the postage. The back is stamped December 3, 1987. 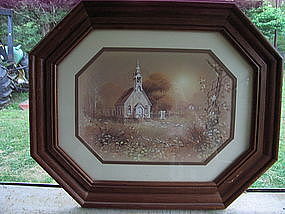 The matting covers most of the artist signature, and it is not possible to identify. It measures approximately 17 x 15 inches. The glass needs cleaning on the inside, but the backing is glued on and could prove difficult. There are some scratches to the frame, caused by being stored with several other framed prints. I need your zip code to calculate the postage. Vintage mirror manufactured in the USA by Homco in 1982. Homco later became Home Interiors. As with most Homco products, the frame is a "Syrocco" type material. 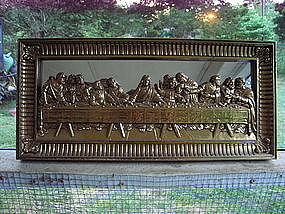 I always thought the figures were brass, but believe that it is the same material as the frame. 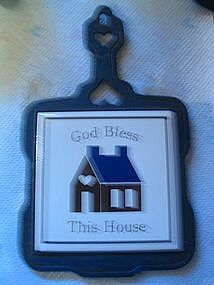 It measures approximately 21 1/2 x 9 3/4 inches. There is a bit of wear to finish of the table, but the faint colors on the it, is a reflection. I need your zip code to calculate the postage. 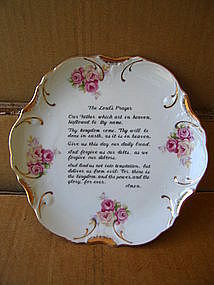 Vintage porcelain Lord's Prayer planter manufactured in Japan. It measures 4 x 3 1/2 inches. Little to no sign of use. There is a piece of florist float in the holder. I need your zip code to calculate the postage. 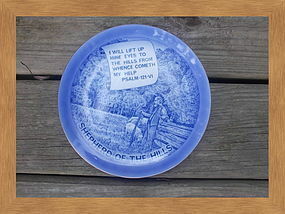 Vintage Baptist Sunday school pin marked Broadman Supplies USA. It measures 5/8 inches. There is no damage other than a spot of wear to the closing device. I need your zip code to calculate the postage. Vintage 7 3/4 inch porcelain plate manufactured in Japan and trimmed in 18K gold. No chips, cracks, breaks or repairs. Minor wear to the finish. Additional photos by email. I need your zip code to calculate the postage. Navy blue cast iron trivet with ceramic tile manufactured in Taiwan during the 1980's. 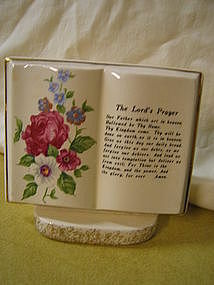 It measures 9 x 5 1/2 inches. It can be hung on the wall, but has 4 feet for cabinet top. No damage. 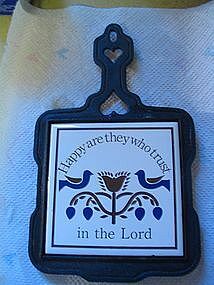 Matching "Happy are They Who Trust in the Lord" trivet is also available for sale. Additional photos or info by email. I need your zip code to calculate the postage. 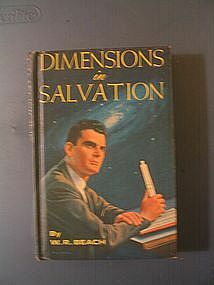 1963 edition written by W. R. Beach and published by Review and Herald Publishing Association. The hardcover shows minor shelf wear, but no soiling or marks. There are no missing pages, rips, tears or staining. Over the years, I've read the book several times and referred back to it countless times, so I can't say it is in new condition, but it has been respected. Please email for photos of all angles of the book. I need your zip code to calculate the postage. 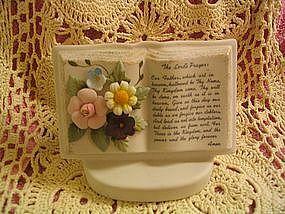 Vintage porcelain wall hanging planter or wall pocket with made in Japan sticker as well stamped NO.E101. 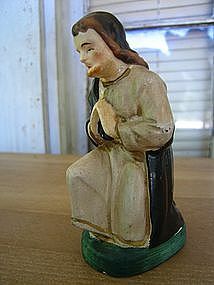 It measures approximately 5" in length, 4" in height and 3 3/4" in depth. The finish is matte and shows no damage. The flowers and leaves are applied and do not appear to have any chipping. There are 2 holes on the back, so it can be used as a wall pocket. I need your zip code to calculate the postage. 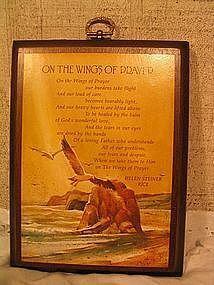 Classique Inspirational Keepsake "On the Wings of Prayer" wooden plaque by Gibson Greetings. Made in the USA but no date. It measures 7 1/2 by 5 3/4 inches. It has metal hanging loop. Need your zip code to calculate the postage. 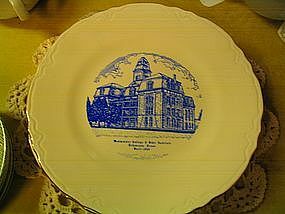 9 1/2 inch plate with information on the back giving a brief history of the college located in Tehuacana, Texas. No chips, cracks or breaks. 3 plates are available. Additional photos upon request. I need your zip code to calculate the postage. 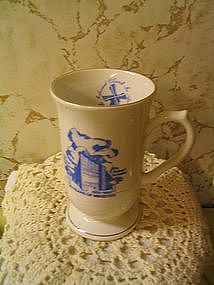 Mug issued in celebration of 30 years of ministry (1955-1985). No chips, cracks or breaks. 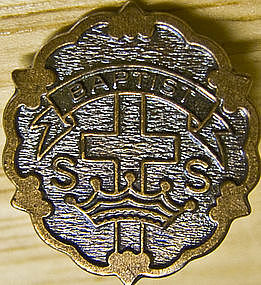 Some loss of trim enamel. I will be happy to provide additional photos. I need your zip code to calculate the postage. Older style shape manufactured in 1978. No chips, cracks or breaks. Small dark spot on the side which I can't identify but will not come off I need your zip code to calculate the postage. 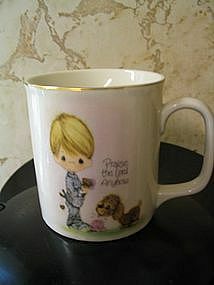 Vintage Alan Grant Legend of the Dogwood Tree. 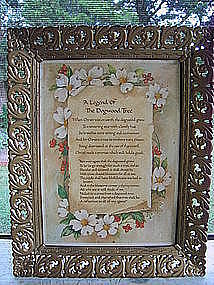 Framed size is 9 3/4 x 7 3/4 inches. Gold plastic molded frame. It was manufactured in the United States by Soroka Sales, Inc. There are no breaks, cracks or chips off the frame, however, there is a bit of loss of paint around the edges of the frame in some areas. There are a few faint stains on print, although due to the shading of the actual print, one must look carefully to find areas. I need your zip code to calculate the postage.